The North York Moors was new for Mellow Velo. 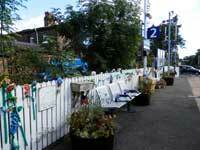 At the end of September, six of us met by Nunthorpe Station outside Middlesbrough. After admiring the locally-made station decorations we headed south through undulating farmland and picturesque villages before beginning the first of many climbs. The NYM are nothing if not hilly. Even veteran Harry Henniker was on record as describing the terrain as "challenging". Steep-sided river valleys mean sharp and twisty ascents and descents - involving much pushing for those of us disinclined to stay in the saddle at all costs. We climbed from farmland to heathery hills and open moors and back again to rushing water-courses, a landscape still replete with villages, hamlets and farmhouses. Day One was a half-day to Osmotherley where we stayed at the Cote Ghyll Mill Bunkhouse: peacefully situated and very comfortable. Day Two involved a "mere" 35 miles round the edge of the Moors via hilly villages such as Hawnby, a lunch stop in Helmsley, then an easier route south of the main road eastwards before climbing again up a long farm valley northwards and over Spaunton Moor. At the end of the day we came down the impossibly steep Rosedale Chimney into Rosedale Abbey - half the group cautiously pushing their bikes, the other half on full brakes for a perilous 600-foot descent, before cycling uphill again out of Rosedale Abbey to our B&B. The weather on the Sunday could not have been more perfect. Still, sunny and warm. We pedalled up to the 1,400-foot watershed and sailed for several miles with views in all directions before dropping down through Little Fryup Dale past the historic Danby Castle (childhood home of Catherine Parr, the last of Henry VIII’s six wives) to the Esk River Valley. The heather strangely not yet out, but on the verge of blossoming and casting a pink haze into the atmosphere. We stopped at the NYM interpretation centre in Danby Village before turning west along the line of the Esk via Commondale, Kildale and Great Ayton, and finally back to Nunthorpe and home. Overall, it's not easy cycling terrain for ordinary cyclists but well worth visiting. It's visually beautiful and historically rich, and there are many places to stop for refreshments, to stay, and to admire. There are some advantages to having no mobile or internet connections. Being in the process of changing my mobile phone provider I was unaware that the trip had been cancelled. So when I arrived at Ingrid's to be informed of this it was too late. So as we had packed the bikes in the car the day before and having arisen early on a Saturday morning, there was no alternative other than to go. Those of you who have been on the road or in the hills with Ingrid will understand that a forecast of torrential rain and gale force winds is no excuse. 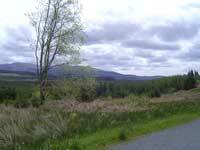 So off we went to Aberfoyle and arrived before the coffee shop opened. There was a wee bit of drizzle but after a freshly cooked bacon butty and coffee from the local butcher we set off. Given the forecast we opted for the Dukes pass road option and were soon warm on the climb and rewarded with overcast but dry weather. 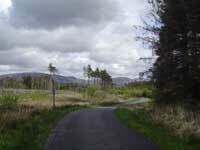 Quiet road and a great freewheel down to Loch Achray. 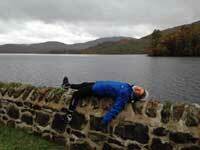 We arrived too early for another coffee at the end of Loch Katrine so continued on. The skies darkened somewhat and after a stop at the McGregor graveyard we encountered a wee shower of rain but only enough to dampen the jacket and not the spirit. That side of the loch has a few wee hills on it but also on the day a following wind!! Thus we arrived at the coffee shop at Stronachlachar, damp but soon steaming in the conservatory with large mugs of coffee and carrot and chocolate fudge cake. By this time the skies were darkening ominously. Now they do say fortune favours the brave and as we tucked into what were generous portions of cake the heavens opened and the rain hammered down on the glass roof. Being generous portions we enjoyed them slowly and by the time we had finished so had the rain to be replaced by azure blue skies and bright sunshine. So we set off up the hill, wind in our back feeling rather smug and when we turned to cycle into the wind well it was all downhill in the trees with no buffeting. All in all a thoroughly enjoyable day. Thanks to Mellow Velo for inviting us and we hope to meet you all one day. Five of us travelled down to Tweedbank on the Borders railway, three on the 7.56 and two on the 8.25. By starting early we managed to avoid casual day-trippers. Three others went down in a car and joined us at Russell's Tea Rooms in Melrose. Lunch was at the Mainstreet Cafe at St Boswells. It had quite an exotic menu, and I was glad that I had booked as it became full. After lunch, we discovered that two of us had flat tyres. One was easily sorted, but the other was a slow puncture that was hard to find. After a lot of stops for investigation and pumping-ups, the rider decided to go fast to Jedburgh (he was one of the fitter members of the group) to get more mileage between pumpings and hope to find a bike shop open there. 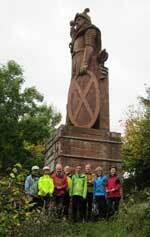 He did, and met us at Jedburgh with his bike sporting a new tyre as well as a new inner tube. The rest of us went at the speed of the slowest - some of us (including me) were feeling a bit below par - past the 185-foot Waterloo Monument and over a long hill past Ulston to avoid the A698 racetrack. In Jedburgh we went by suburban streets, over an old bridge, and through an underpass to get to the town centre without going on more than a few yards of the A68, Excellent - except that we arrived at 4 o'clock, just as all the cafes were closing. We bought food for supper at the Co-op, whose 'reduced' section once again came up trumps: that day's bargain was salmon at £3 a kilo. Mainly thanks to the puncture problems, we left Jedburgh nearly an hour behind schedule. 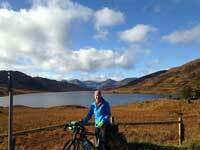 The 15-mile ride from there to Kirk Yetholm was hilly, cold, and tiring. At Morebattle the light started to fade, and the last two miles to the hostel were done in the dark. Putting the bikes in the shed was fun: we got most of them in, but not all, and then the warden pointed out a door at the back that led to an annexe - but the only way to get the door open was to take all the bikes out again, and in the annexe there was a lot of junk that had to be moved. But we managed to fit three bikes in there and that left room in the main part of the shed for all the others. After the weary group prepared, ate and cleared up supper, it felt well past bedtime. So much for Saturday. Sunday was much better: the weather was warmer, the terrain flatter, and the group smaller. The ride went to Berwick because it would have been difficult getting all of us on the Borders line on Sunday evening with its less frequent trains. The two who were going back to the car at Melrose went via Cornhill and Kelso, while the rest of us went via Kelso and Cornhill and passed the others half-way. At Kelso I had found a cafe that claimed to be open on Sunday mornings - but not that Sunday, when the owners were away and the cafe had been emptied for a thorough spring-clean. After some enquiries and a circumnavigation of Kelso's setted streets we found that the garden centre had a cafe which served, among other things, a surprisingly cheap cooked breakfast. Cornhill's cafe was open until 2pm on Sunday - but we arrived at 1.15 to find that it didn't serve hot meals after 1.00. However, it could do hot drinks, toasted teacakes and cold (and filling) desserts. After crossing Coldstream Bridge we turned north to join NCN Route 1. Between Upsettlington and Paxton Route 1 takes a long detour, and one of us who was quite tired at that point decided to take the short cut through Horndean. The rest of us went through Norham, past its 12th-century castle, to the Chain Bridge Honey Farm which has not only everything to know about bees and honey, but a cafe in a double-deck bus, a collection of vintage vehicles, and in its museum a section on railways - I had to prise some of us away in order to continue over the Chain Bridge and on towards Berwick. We crossed the border for a fifth time at Paxton, and got to Berwick station in time for our respective trains. On my train I found that the bike spaces had been overbooked but I could lay mine on the floor. Despite the frustrations and effort, everyone enjoyed the weekend. I would like to do this trip again, but next time I hope to make the first day a bit easier. We continued south, climbing then descending, with excellent views and sunshine, to Fowlis Wester where we enjoyed a visit to the church – admiring the ancient Pictish stone and the beautiful new stained glass window. 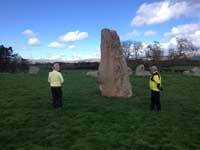 We turned left to Balgowan and celebrated a good day with coffee and cakes at Gloagburn, just before Tibbermore. (Total 35 miles). Two day-riders went home, three were staying locally and the remaining 8 headed off-road via Noah’s Ark to Perth Hostel. I underst and we had climbed 3100 feet! 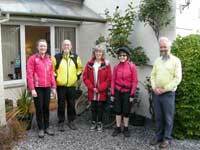 One of the aims of the weekend was to check-out the hostel (on Crieff Road, A85). Most of the year it is the student accommodation for Perth College, University of the Highlands and Islands. (Bikes can be locked up and there’s a big car-park.) 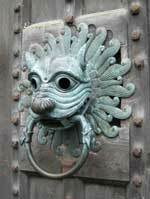 They provide single en-suite rooms, in flatlets of 4/5 – for £24 each. (Best to book in groups of 4 to get rooms in same flatlet.) Saucepans etc were somewhat sparse but Tiana, Jenny and Paul produced a large curry and we were ‘fair pleased’ with ourselves. Next morning we crossed the Tay on the West Bridge for a ride east of Perth, 2 of yesterday’s riders joining us 8 miles north. 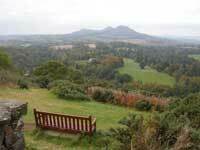 Going via Waulkmill, Stormontfield, Byres, Craigholm and Collace, we were soon at Dunsinane Hill brushing up our knowledge of Macbeth and then climbing to join B953 to Abernyte. Lunch was booked at the Scottish Antiques and Art Centre one mile beyond Abernyte. We arrived one hour early – a first for Mellowvelo – and were pleased with the menu/ service, etc. A very cheery group enjoyed yet another successful weekend for Mellowvelo. Sunshine a great bonus. Despite the best attempts of the Edinburgh to Glasgow railway connection (both the Linlithgow line and the line to Glasgow Central were closed) there were seven on this year’s trip. Despite three different ferry sailings being used to get to Arran we did all meet up, briefly at Machrie Tea Rooms and finally at Lochranza Youth Hostel. It was agreed, I think, that Machrie Tea rooms has one of the best offerings of cakes in Scotland – well worth a detour never mind just stopping if you are passing. An unfortunate bit of democracy crept into the weekend (something that should generally be discouraged in MV events I think) and it was decided to go to the Lochranza Hotel for a pub dinner rather than self-cater in the Hostel. That worked well. 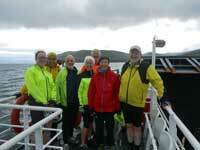 Then several firsts the next day: we made it into Tarbet in time for the 11:15 ferry. I don’t remember that happening before. It was close but we did it. 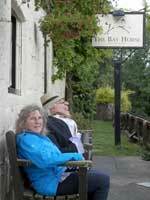 Then Lynn knew of a tea room for lunch on the way over to Tighnabruaich, The Barn at Millhouse. Another excellent stop. Highly recommended. The slog up the A8003 to the top of the Kyles of Bute is just about worth it for the view. Then there was another first when the party arrived together at bridge over the Ruel at the bottom of the hill. Fairly uneventful haul back Rothesay, with time for the mandatory Ice Cream before the Wemyss Bay ferry. And home remarkably early, managing to get on the first train out of Queen Street to Edinburgh once Scotrail managed to make up their mind as to which train it was. Five of us intended to go on this lovely moorland ride across Northumberland. The first hiccough was before we started! Anna and Jan M were not allowed on the train from Carlisle! They came on the following train, using the interlude to visit the map shop. Meanwhile the remaining three (Barbara, Tiana and Jan U) who were refreshed and calm, emerged from the excellent Kasteale café in Haltwhistle and set off up into the hills. The first six miles were generally uphill; the next five were on track -two miles of skirting huge puddles and three of gravel - then relief – tarmac! 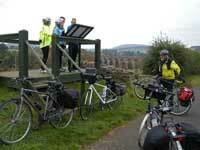 The NCN68 takes you through some lovely traffic–free countryside but it is hard work. We arrived in Bellingham at 3pm for a late lunch. Half an hour later, who should arrive but the recently mapless two! They had set off from Haltwhistle an hour after us and taken the minor roads (avoiding the high moorland) and covered a distance of 27 miles to our 22. The soup at the Rocky Road café was excellent and suitably refreshed; we set off after 4pm for the next 22 miles. 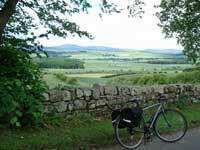 We followed the NCN68 to Elsdon, a lovely wee village with a tower and a café – unsurprisingly closed at 5.45 – so we had a break at the picnic spot four miles further on. 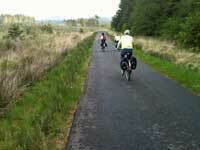 Then we followed a branch of the cycleway into Rothbury. 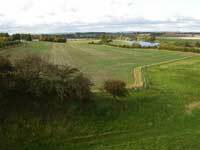 It boasts one of Northumberland’s iconic views across the ox-bow bend in the river Coquet. We arrived at Tomlinson’s at 7.30 – not bad considering – and rescheduled our table at the Newcastle House Hotel for 8.30pm. We were rather glad not to have to self-cater! Menu good, but rather short on the veggie options. It boasts a couple of beers on tap too. In true MV style, the rain stopped on Sunday morning just as we set off! 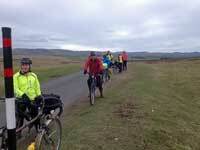 We cycled through the pleasant undulating landscape to Powburn where we realised we were one down. I am so used to leading from the back that I had failed to appreciate that there maybe someone behind! Anna soon caught up and we settled down to coffee and scones in the café in the emporium. It’s a bric-à-brac collector’s heaven – even the crockery used in the café reminds you of your granny’s china cabinet! Fortified, we set off to Eglingham and the back route to Wooler. The two Jan’s were too fortified and overshot a turnoff. Fortunately I saw them disappearing over the horizon - unfortunately map 75 was not one of the ones purchased in Carlisle. 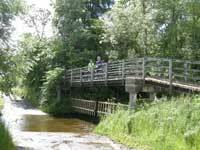 There followed a few phone calls to bring them back to order at the bridge over the river Till near Wooler. They missed the ford at East Liliburn – but hey! we were back on track. By now we were peckish again and decided to picnic by the fibreglass cow in Doddington. I had warned that there was a notice on the Doddington dairy cart hat it was not open at weekends (weekend folk being less honest than the weekday variety presumably). However when we arrived – O joy! – a few ice-creams still in the cart! We paid and consumed. Now the countryside was considerably less hilly and we bounced along to the next watering hole – Lavender Tearooms in Etal where we arrived moments before a sharp shower. It had finished by the time we left and we were once again in sunshine for the last leg to Berwick. Anna left us at Felkington to catch an earlier train. 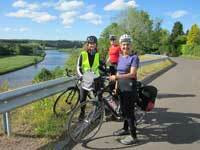 The remaining four cycled to Horncliffe to join the NCN1 into Berwick via the chain bridge (52 miles). All in all a grand weekend. Thankfully not the forecast hot temperatures all the time, but a good mixture of sun and shade. In sporting terms it was a weekend of ‘two halves’ for the the first weekend ride I organised for Mellow Velo. The forecast for the Saturday was far from promising - 40-50mph winds and rain too - could it get worse for early June? At least the forecast for Sunday looked more promising. I had recce’d the ride the previous weekend as part of the Carlisle to Glasgow route (the slightly out-of-date, Lochs and Glens South map produced by Sustrans) and had come across some concerning issues. My original suggested route for Saturday would have involved us climbing up a monster hill that should only be tackled by masochistic road bikers; even worse was the distinct lack of cafes for the second 75% of the route on Sunday. On Saturday morning I travelled with Paul to Ayr by car, whilst Alec, Jenny and Tiana travelled by train to arrive for 10.18. Paul and I suspected we were in trouble with the weather by the way the car was being buffeted by the gales on the M77 and on arrival in Ayr our attempt at opening the car doors on the Esplanade nearly resulted in them being blown off! Meanwhile, the other three had arrived at Ayr station and announced they planned to take the next train to Barrhill (the nearest station to Newton Stewart) and intended to ride from there to our B&B. Paul then drove the two of us to the town of Maybole and located an overnight parking space outside the church that is conveniently located near the train station. Thankfully, there wasn't long to wait for a train to Girvan which was the next station on the line, but enough time to fit in a coffee at the Carrick Cafe which is part of the church building. We cycled from there, via Barrhill, to The Stables Guest House in Newton Stewart on a combination of the B734, the A714 (surprisingly quiet) and B7027. The wind had also died down somewhat as we were away from the coast. Unfortunately, we all, in our two groups, encountered a very heavy rain shower at around 1.30 that took some time to properly clear away. 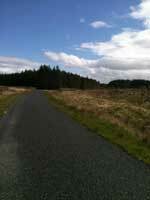 The road from Barrhill to Newton Stewart is to be recommended; its surface was well maintained (especially on the Ayrshire side of the boundary) and the scenery was very pleasant. Alec, Jenny and Tiana managed to fit in refreshments at both an early-closing cafe in Barrhill and another in Newton Stewart (both of which Paul and I missed out on) and had arrived at The Stables not long before the remaining two team members. Our hostess, Jacqui, kindly provided a large pot of tea and a plate of biscuits for her slightly wet and windswept guests. This was followed up by a pleasant evening meal at the nearby Galloway Arms. Mileage on Saturday for Paul and Jan of 37 miles, and around 19 for the remaining three team members. Thankfully, Sunday did indeed bring better weather; after an early breakfast and a few photographs outside The Stables we were en route by 9.30 to the Glen Trool Forest via NCN7. I had hoped to arrive at the visitor centre by 10.45 and was concerned we’d set off around 15 minutes later than I planned, but we were there at 10.40 for a second tea/coffee. We were on course for departure by 11.30 when certain members of the group became distracted by a bicycle leaning on the fence that had been adapted to take an electric motor. When the owner appeared, he was questioned about its mechanics which he was pleased to demonstrate - given what I had told the group about the height of the next section of the route, I feared the owner would be offered a generous trade-in for a non-electric, purely person-powered, bike for the day. Thankfully, no such deal was brokered and we were on our way on NCN7 again. There was much anticipation for sight of the monster hill ‘The Nick of the Balloch’ that had caused me concern on the recce ride. I didn't need to announce it when we got there - the long, steep and rather cold swoop down told its own story, and definitely the correct direction in which to tackle it. According to an online blog for road bikers, it ranks as 110 in the list of most difficult UK hills to climb! By the end of the descent we needed sustenance and a pleasant, sunny spot out of the wind was found by a bridge over the River Stinchar, just beyond the hamlets of North and South Balloch. We were now in a valley; the only way out of there was to climb up Doughty Hill and another, slightly higher, hill called The Pilot. They were thankfully not nearly as high or steep as ‘Nick’. Only Alec and I had cycled up them before - Alec having tackled The Pilot back in 1982, but clearly had not forgotten the experience! It was a long haul, (in my spin class it would be described as a ‘hero climb’) but we all made it intact, if rather tired, up the climb. We were rewarded by a relatively flat section, then a long downward ride into the village of Crosshill (a cafe and pub-free zone; the nearest cafe would be in Kirkmichael, involving a two mile diversion) and onwards to Maybole on the B7023, rather than the circuitous NCN7. 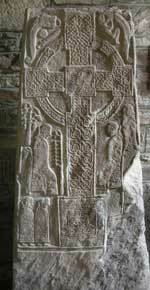 Paul and Jenny remained in Maybole to collect the car and make their way home to Edinburgh. Tiana, Alec and I cycled on to Ayr along the surprisingly speedy B7024 to Ayr for a rather earlier train home than had been anticipated. 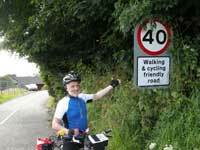 It was around 43 miles from Newton Stewart to Ayr train station, as we had utilised the main B roads, rather than relying purely on NCN7 which would have increased the mileage to 48. I stayed overnight in Ayr, and next day cycled the remaining 50 miles on the Lochs and Glens South Route to Glasgow on a rather pleasant and dry day - a ride that I can thoroughly recommend, along with the Italian deli in Lochwinnoch which does a lovely chocolate and beetroot cake. A perfectly formed gaggle of 2, Cathie & I finally made it to Cairngorm this year. A warm day of light cloud and some sunny intervals – ideal cycling really, so we set off on the standard route down the improved Old Logging Trail to Rothiemurchus, then continued towards Aviemore to The Bridge Inn, then took to the NCN path and The Speyside Way with a diversion into the golf course having missed a crazily placed direction board. This took us round following the line of the steam railway to Boat of Garten. We missed the RSPB Osprey centre as there are no chicks this year, then followed the forest path to Nethybridge for lunch in the hotel – which was well up to the usual standard. Then heading off for the long gentle climb through the forest to Forest Lodge at a more leisurely pace than usual. On this section when you stop, there really is nothing to hear apart from birdsong and a small stream – it is so inordinately quiet and tranquil out there. This time, as last, after turning right we took the left fork for the path we explored two years ago, smoother and not so high to climb but missing out on passing Rynettin cottage. We also noted the indicated mileage from the gate “Glenmore 8 miles”? – very pessimistic! my Garmin makes it barely 6 to the Youth Hostel ! The path over the level open section of the col from below Rynettin to Ryvoan bothy has been improved almost beyond recognition. The views haven’t – probably couldn’t and the dusting of snow from the day before was much in evidence. A brief stop at Ryvoan bothy where I scared the living daylights out of someone who had spent the night there by appearing round the corner of the bothy – having thought he must have seen me arrive. The descent after the bothy is now the only section on this outing where MTBs are any benefit as it is untouched by improvements. 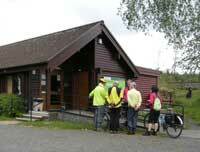 We all pulled up at the lochan for a photo and look at a very tastefully done newly built bench and viewing platform. Here we met two other cyclists heading up the hill on tourers – reckon they didn’t get much further - along with a group of youngish walkers who were staying at the hostel and walking in lightweight coats and trainers, it wouldn’t have been me but I reckon despite the very threatening colour of the sky and lifting wind they actually got back dry. Then onward and downward for a rapid return to the hostel and a hot chocolate and cake in Glenmore café watching the birds on their feeders before welcome showers and dinner orders in the hostel. The hostel food and service was excellent as usual with the bonus of being offered free cooked breakfast food on one morning as they had an excess – it would have been rude to refuse. It was cold, damp and windy so cycling was abandoned in favour of a visit to Inschriach coffee shop and two or three hours in the wonderful Highland Folk Museum at Newtonmore followed by soup and sandwich in their excellent café before heading home. This trip nearly got off to a bad start when the guard on John and Jude's train from Glasgow forgot to let them off in Penrith. Fortunately the staff on the platform responded to the frantic yells and rescued them. Alec, Barbara and Tiana had arrived on earlier trains from Edinburgh, and we rode a few miles to Brougham Hall to meet Jan and Paul, who had come by car and were already installed in the café. 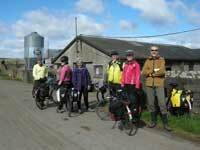 Refreshed, we followed NCN71 to the Mill Yard Café in Morland for lunch, passing a field of llamas on the way. The stop was well timed because a cold rain began to fall. The café was busy but the food was worth the wait and the weather had dried up by the time that we left. We continued to King’s Meaburn, where one of our party had come to grief in the ford on a previous ride. Undeterred, Jude risked riding through the water and got across without mishap. At a signpost with a fancy crown-shaped fineal we left NCN71 and rode toward Crosby Ravensworth. The war memorial on the village hall had several sets of deaths with the same surname, six Ellwoods for example. The village had an iron bench from the QEII coronation as well. A lengthy climb took us onto the moors, leaving the farmland behind. 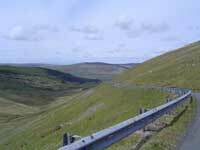 The junction with the B6260 was the summit of the route at 344m, followed by an exciting descent into Orton. Here we tested the Orton Scar Café, whose cakes were excellent. We now joined another Sustrans route, NCN68, and climbed steadily up the moorland on a delightful road with cattle grids. Yet another Sustrans route, NCN70, took us to Soulby, where they seem to collect old signs: railway notices to shut the gate and an enamelled sign for a public telephone, long gone. Most of the party shot ahead of the leader and took the wrong road but luckily it rejoined the correct route in Kirkby Stephen. 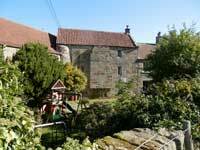 The hostel is in an old methodist chapel and was formerly YHA but is now privately owned. The owner's sister, Karen, was in charge and cooked a meal for us. Our request for a vegetarian meal had been translated as just one vegetarian portion but we needed two; unfazed, Karen rustled up a butter-bean stroganoff while we had our showers. We retired to bed early because the hostel was getting chilly. The sun was shining next morning, showing the stone buildings in the town at their best. We spotted a signpost near the hostel that gave distances to the nearest furlong (one-eighth of a mile for those too young to have been taught furlongs, chains, rods, poles, perches and all that at school). 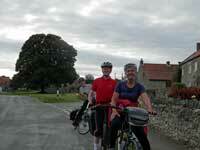 We took an undulating but direct route to Appleby-in-Westmorland. The planned café was closed but Corrie’s Tea Room by the bridge had convenient cycle parking at the rear as well as a good view. Leaving Appleby we took a straightened-out version of NCN68. Several sheep-shaped signs advertised the Sheepfest in Milburn next Monday and we passed an ice-cream factory in Hunsonby. A steep descent through Little Salkeld, now on NCN7, took us to the Watermill Tea Room for lunch around 1400. It had excellent bread but rather pricey. Afterwards we had to climb back up the hill to visit Long Meg and her Daughters, a single tall megalith just outside a large stone circle. The site had some ancient trees too, one of which had slips of fabric tied to low branches; some kind of pagan offering? 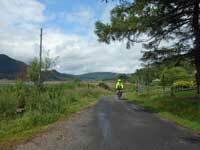 Eventually we resumed our journey on NCN7. I spotted a cyclist paused by the side of the road who looked a possible recruit to Mellow Velo. 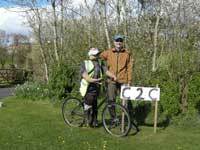 It turned out to be a scarecrow advertising the C2C route and the garden behind displayed a sign for ‘Vote Scarecrow’. This was just before the 2015 general election. I had promised that the rest of the ride would be flat and was taken unawares by a climb of over 100m in the last few miles. Oops! It gave us a fast descent into Penrith and the journey home. 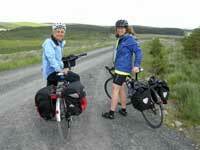 We covered only about 35 miles each day but most of the roads were hilly. The terrain around the upper Eden Valley was more varied than on our ride in the lower part of the valley last year, with farmland on lower ground and higher roads over the moors. Many places had lovely names, such as Crosby Ravensworth, Maulds Meaburn and Ravenstonedale, although Tebay was more memorable because of its motorway services! We were lucky with the weather; the forecast was ominous but we kept dry after lunch on Saturday and we saw plenty of sun. The brisk wind was chilly, though, and it dropped down to freezing point overnight. A good start to the weekend rides for 2015 although we didn't manage to include the Lake District. That will have to wait for next year.